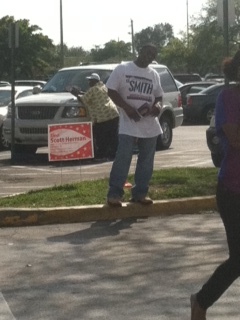 This guy was one of the many who bombarded me on my way to the polls. I woke up this morning and thought, “Hmmmm…what a nice day for a stroll to the polls.” I grabbed my “Produced by Faith” book, my sweater because it’s starting to get cooler here, and had my iPhone in tow for my musical pleasure. I anticipated that I would have been standing in a long line since my mom warned me that there would be one according to the morning news. It was a nice walk. I took my time even spent most of it talking to my girlfriend Gwen on the phone. Once I got to my destination, volunteers directed me to the front of the building. I was wondering where everybody was because it looked like nothing was happening. I followed the directions of the blue-haired volunteer and as soon as I turned the corner to where I needed to be, BOOM! IT WAS THE PAPARAZZI(see the guy in the photo)…EXCEPT THEY DIDN’T HAVE CAMERAS…THEY HAD FLYERS, PAMPHLETS, POSTCARDS, YOU NAME IT! ALL RUSHING AT ME TELLING ME WHO TO VOTE FOR! I WAS LIKE…WHAT THE HELL IS GOING ON??? What was even more annoying about that horrible intrusion was the deception of who was Democrat and who was Republican. One person would hand me a list of names telling me they were all Democrats and then I walked about another five feet and somebody else would tell me those names were actually Republicans and then hand a new list of names proclaiming Democrats. I had enough! All I wanted to do was get inside and cast my vote. That’s all! I went inside and I was a little worried because although I was registered to vote in Florida, I still had my Georgia driver’s license (i love my GA driver’s license…best pic EVER!). Thankfully…it wasn’t a problem and I moved right along to my polling station. The line was short and moved smoothly and quickly. Funny though how after I got to my post, I looked behind and a mass a people showed up out of nowhere. Ha! Immediately I got down to business and filled in my bubble for the presidency. As I scrolled down the ballot and casted my vote regarding other issues, I had an overwhelming feeling that I wasn’t just voting for myself. I felt like I was voting for my mom who is a senior citizen but is not a citizen of the United States. I voted for my brother who is incarcerated and does not have the right to vote. I felt like I voted for so many people that I know for whatever reason are not a registered voter. It felt like a HUGE responsibility. Welp…I’ve done what I was suppose to do and now I wait with the rest of the country to find out who will be in charge for the next 4 years. I voted yesterday. stood in line for almost 3 hrs..had a great time! Wow! 3 hours?? Pammie I was probably there all of 45 minutes.